The 11th largest city in Michigan with a population of just over 80 thousand is the scene of a feel-good story pitting right versus left, conservative against liberal, and the Tea Party against well, everybody else. As a result of the economic downturn brought on the 2008 financial crisis, Troy suffered like much of the United States and the rest of the world from the hardships of the recession. Like many organisations, municipalities and governments, never mind individual households, sacrifices had to be made to accommodate a drop in income. According to reports, the decrease in property values meant a 20% loss in city revenue. The public library was one of several city services put on the chopping block unless a tax increase was passed to provide additional operating funds. In February 2010, due to the efforts of Troy Citizens United, a highly organized anti-tax group, a proposed tax increase did not pass. In the fall of 2010, the city came back with a proposed library-only tax increase of a miniscule 0.7% to ensure the doors of the public library remained open. Once again Troy Citizens United prevailed and the increase was voted down. The library was set to close in the spring of 2011 but supporters decided in June 2011 to try their hand one last time at passing a tax increase on August 2, 2011. If this failed, the library was set to close up shop on August 5. They had merely 6 weeks to rally the troops and turn the public tide in favour of this 0.7% tax increase to save the library but what to do exactly? In steps a guardian angel, Leo Burnett Detroit. Leo Burnett is an international advertising firm with 97 offices in 84 countries and more than 8,500 employees. Its clients include McDonald’s, Coca-Cola, Walt Disney, Marlboro, Maytag, Kellogg's, Tampax, Nintendo, Philips, Samsung, Visa, Wrigley’s, Hallmark, Allstate Insurance, Procter & Gamble and others. The Detroit office of the firm decided to help save the Troy Library. Their chosen method? Reverse psychology. 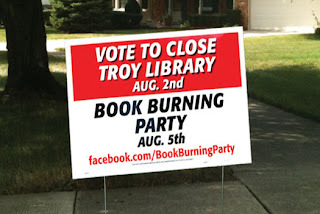 Staff from the agency pretended to be a fake political group, Safeguarding American Families (SAFe) and started their own campaign to close the library by distributing yard signs with the message, "Vote to Close Troy Library Aug. 2nd Book Burning Party Aug. 5th". They included a Facebook page (now taken down). Relying on the power of social media, Burnett's campaign increased the outrage factor by apparently posting videos of burning books on Facebook and Twitter, creating "check-ins" to the Book Burning Party and offering merchandise. According to reports, Burnett advertised a musical group for the party and tips on who to contact for baby-sitting services. The reverse psychology had its effect. According to reports, people were enraged and left comments on Facebook that they were sick and disgusted by a book burning and that they would vote yes to save the library. It would seem that the audaciousness of the plan caught the attention of many outside Troy as national even international news began reporting on the story. On July 11, 2011, Leo Burnett revealed their ruse and explained the true meaning of the campaign: "A Vote Against The Library Is Like A Vote To Burn Books." On August 2nd, 324% more voters than expected turned up to vote on the tax increase and the overwhelming majority voted yes to it. How did the campaign succeed? Leo Burnett had managed to change the question. Instead of it being a vote about a tax increase, it had become a vote about saving the library. YouTube: Save the Troy Library "Adventures In Reverse Psychology"
Who wants taxes? Who wants a tax increase? Heck, I'd be the first one to say that I pay enough, just how much more does the system want to squeeze out of me? But wait a minute. I also want the roads, the parks, the various services and, of course, the library. However, who pays for all that stuff? I do. You do. We do. We all do; we all contribute to the greater good. It is our individual sacrifice for "our" benefit, the benefit of all of us. It is us, a bunch of individuals working together so we can all enjoy something, like a library, that individually we couldn't have. During the 2008 presidential election, when Joe the Plumber asked Obama about his small business tax policy, Obama's response included the statement, "when you spread the wealth around, it’s good for everybody." Conservatives jumped on the idea of wealth distribution as socialism. Ooo, the "S" word. Is having a public library socialism? No, it's sacrifice, shared sacrifice for the greater good. Sacrifice is a great "S" word. But a comparison is in order. According to The Tax Policy Centre, a joint venture of the Urban Institute and the Brookings Institution providing analysis and facts about tax policy, U.S. taxes are low relative to those in other developed countries. What? But why? In many European countries taxes exceeded 40 percent of GDP [U.S. = 26%], but those countries generally provide much more extensive government services to their citizens than the United States does. Gee, are there more libraries in France? Why do I hear Conservatives jumping up and down all the time about not raising taxes when taxes in the United States are low compared to other developed countries? Why don't the Conservatives say anything about that? Or do they even know? This is an interesting story about public perception. Would you vote to raise taxes or would you vote to save the public library? It is also an interesting story about how Conservatives blindly follow the mantra of not raising taxes without seeming to understand the implications of this and how other things are interrelated. I have expressed my concern over and over again that the issues at hand are complex and how it seems that everyone is looking for an easy answer. Yes, I don't want to pay higher taxes but on the other hand, I don't want the public library to close. Yes, I don't want to pay higher taxes but on the other hand, I don't want to give up the roads, the parks, the public swimming pools, and heavens knows what other services the community offers me. Distributing the wealth isn't socialism, it's sacrifice. It's a shared sacrifice. After all, it's "my" community. It's "my" public library. Troy is a city in Oakland County in the U.S. state of Michigan, and is a suburb of Detroit. The population was 80,980 at the 2010 census, making it the 11th-largest city in Michigan by population, and the largest city in Oakland County. Troy has become a business and shopping destination in the Metro Detroit area, with numerous office centers and the upscale Somerset Collection . When is the Troy Public Library closing? On May 10, the Troy City Council adopted a fiscal year 2010-11 budget by a 4-3 vote which is in line with Option 1. Option 1 reduces Library hours in 2010-11, and closes the Library on July 1, 2011. Leo Burnett Worldwide is an American advertising company, created in 1935 in Chicago by Leo Burnett. Now it is a worldwide company. Today, Leo Burnett Worldwide is a part of the French group Publicis. Its clients include McDonald’s, Coca-Cola, Walt Disney, Marlboro, Maytag, Kellogg's, Tampax, Nintendo, Philips, Samsung, Visa, Wrigley’s, Hallmark, Allstate Insurance, Procter & Gamble and others. It has 97 offices in 84 countries and more than 8,500 employees. This organisation brings up many interesting points of discussion about the various expenditures of the city of Troy. True? False? What would a thorough investigation reveal? Just were is the truth?